Understanding the latest mesothelioma statistics can help patients and their loved ones make better, informed decisions. Mesothelioma statistics are always changing, and understanding the most recent mesothelioma information can help patients and their loved ones make more informed decisions about treatment and next steps. This data can also help the general public get a better understanding of this devastating rare cancer that many know very little about. Here are some of the latest facts and research around mesothelioma and asbestos to help both patients and the general population learn about the disease. 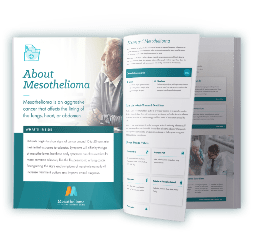 It’s important to remember that many of these statistics and mesothelioma facts may appear cold and frightening, but the risk for the disease and its progression in a patient will be unique for each individual. Mesothelioma incidence refers to the number of people diagnosed with the disease. The most recent reports from the Centers for Disease Control and Prevention (CDC) estimate that there are about 2,400 – 2,800 new mesothelioma cases in the United States each year. The number of cases has remained rather steady over the years, partially because of the disease’s long latency period. There were 54,418 documented cases of mesothelioma between 1999 and 2015. That’s the equivalent of about 1 person diagnosed per every 100,000 Americans. Though the disease is rare, with the latest numbers from the National Institute of Health (NIH) estimating people only face a 0.04% chance of developing the cancer in their lifetime, it can still potentially affect millions. Research has estimated at least 20 million people could develop the disease, and millions of people around the world are exposed to asbestos each year. Those exposed may also face a number of other asbestos-related diseases, like lung cancer and asbestosis. In addition to its rarity, mesothelioma is often most commonly linked to its poor prognosis. Because of the latency period and nonspecific mesothelioma symptoms, diagnosis is often delayed. Reports have shown that mesothelioma patients on average survive 12 to 21 months, though survival rates have improved slightly in recent years because of clinical trials and new treatment options, like immunotherapy. Peritoneal mesothelioma in particular has seen much improved survival rates in recent years, with studies showing a 5-year survival of at least 50%. This progress is largely attributed to cytoreductive surgery plus HIPEC, a heated chemotherapy applied throughout the chest cavity. Malignant pleural mesothelioma, the most common form, has seen minimal progress, with the most recent survival statistics showing an improvement of only about 0.5% each year. As clinical trials continue to study these emerging mesothelioma treatments, as well as test new diagnostic methods, mesothelioma doctors hope to see life expectancy and survival rates continue to improve. While survival rates have improved slightly, overall malignant mesothelioma mortality rate has also remained rather steady over the years. From 1999 to 2015, mortality data showed 45,009 recorded mesothelioma deaths. That equals to a mortality rate of about 8 people per million annually in the United States. Though it might not seem like a high number, researchers have found that there are at least 2,500 mesothelioma deaths each year – about the same as the number of new cases each year. A number of risk factors can influence a mesothelioma diagnosis, including a person’s age and gender. In general, mesothelioma cancer is more common in the older population, though researchers have seen an increase in diagnoses among younger demographics because of genetics and asbestos exposure through home renovation projects. However, the latest mesothelioma information still suggests around 91% of all mesothelioma diagnoses occur in patients aged 55 or older. 74 years old is the average age of mesothelioma diagnoses in the United States. In comparison, 66 years old is the average age of diagnosis across all types of cancer. In addition to age, research has found that mesothelioma is more common in men than women, with 75% of mesothelioma deaths attributed to men. Reports estimate that this large disparity is at least partially due to occupational exposure. Asbestos exposure is most common in the workplace, with men more prevalently holding jobs in asbestos industries, like construction, for many years. Location can also have a large impact on mesothelioma diagnosis and mortality, since certain occupations were more likely to rely on asbestos, and the fibrous mineral occurs naturally in various pockets across the country. Research has also shown that mesothelioma deaths are 2 to 4 times higher in port cities and parts of the Rust Belt because of the higher prevalence of asbestos. Since asbestos is still not fully banned in the United States, it’s important for the public to be well educated on the toxin and prevent dangerous exposure that can lead to mesothelioma or other asbestos-related diseases. Asbestos Use in the U.S.
Asbestos has a long history in the United States, despite researchers discovering the health risks of exposure by the 1920s, if not earlier. There were thousands of asbestos products on the market for many years. Though asbestos use today is not nearly as prevalent as it used to be, advocates are still hoping for a full ban on the toxin in the near future. The Environmental Protection Agency (EPA) is currently investigating asbestos and nine other dangerous chemicals for potential changes in legislation, such as a ban. At its peak, the U.S. imported over 803,000 tons of asbestos in 1973. 340 pounds of raw asbestos were imported in 2016. The last asbestos mine in the United States closed in 2002. Over 25.6 million pounds of asbestos were disposed of in 2015. 1 Centers for Disease Control and Prevention. Malignant Mesothelioma Mortality — United States, 1999–2015. Updated March 2017. 2 Centers for Disease Control and Prevention, National Center for Health Statistics. Underlying Cause of Death 1999-2010 on CDC WONDER Online Database. 5 National Cancer Institute. SEER Cancer Statistics Review 1975-2014. 6 National Cancer Institute. Median Age of Cancer Patients at Diagnosis, 2011-2015. SEER Cancer Statistics Review, 1975-2015. 7 U.S. Environmental Protection Agency. U.S. Federal Bans on Asbestos. Page last modified on March 26, 2019.